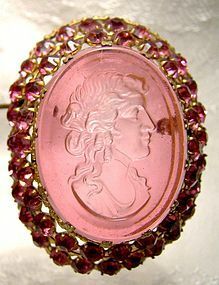 A molded pink glass cameo gilt brass pin circa 1910. 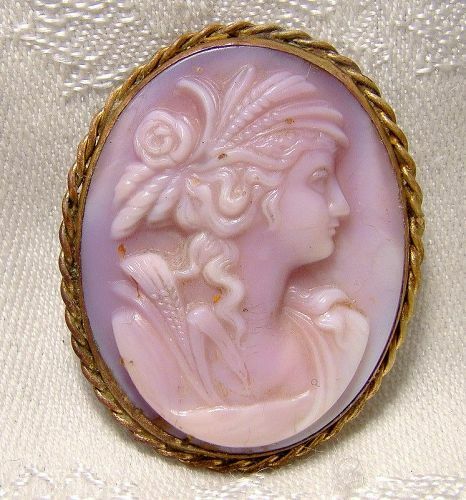 This Edwardian Austro-Hungarian or Czechoslovakian brooch features a high relief maiden cameo in purplish/pink molded glass in a gilded brass setting. This 1-3/4 x 1-3/8" unsigned pin has the original c-clasp and it is in very good condition with no chips, cracks, dents, bends, corrosion, damage or repairs other than the loss of most of the gold plating to the brass surround. All items are thoroughly and conservatively graded and all condition issues are noted; all items are vintage or antique and may have slight signs of gentle use. Tracked Packet shipping to anywhere in the U.S. is $14.00 - this includes online tracking, air service and insurance up to $70. Items paid with a credit card will be shipped to confirmed addresses only. We do ship internationally. All of our prices are in $US. PLEASE NOTE: We DO NOT accept PayPal. A signed BJL marcasites with blue and green enamel peacock brooch circa 1950s 1960. This vintage 2" x 1" rhodium plated and marquisite figural pin ihas excellent detail. Research as far as we have found has indicated a Canadian maker, and we have run across a few pieces before marked this way, but still looking for details. This ornate bird brooch has a safety clasp, it is signed BJL, and the enamel is bright with royal and cobalt blue, emerald green, orange and yellow. It also has green on the head feathers, and this pin is in excellent condition with no chips, cracks, dents, bends, corrosion, losses, damage or repairs. All items are thoroughly and conservatively graded and all condition issues are noted; all items are vintage or antique and may have slight signs of gentle use. Tracked Packet shipping to anywhere in the U.S. is $13.50 - this includes online tracking, air service and insurance up to $70. Items paid with a credit card will be shipped to confirmed addresses only. We do ship internationally. All of our prices are in $US. PLEASE NOTE: We DO NOT accept PayPal. 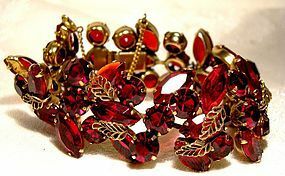 An exceptional signed Kramer of NY gold plated rhinestone bracelet with wonderful claw set deep cherry red rhinestones circa 1950s. This large and lovely vintage bracelet also features attached filigree openwork leaves and it has a safety chain as well. It closes with a mostly hidden box clasp and the signature is there. It measures 7-1/4" long and is 1-1/4" wide. The rhinestones are unfoiled with open backs in round and marquise cuts. We couldn't quite get the deep cherry or garnet red of the stones in our pictures. It is a star in any vintage costume jewellery collection, and one of the one of the most irresistably wearable pieces. This collectible bracelet is in excellent condition with no chips, cracks, dents, bends, corrosion, losses, damage or repairs. All items are thoroughly and conservatively graded and all condition issues are noted; all items are vintage or antique and may have slight signs of gentle use. Expedited tracked and insured parcel shipping to the U.S. starts at $22 (other spots may vary, air is higher). Items paid with a credit card will be shipped to confirmed addresses only. We do ship internationally. All of our prices are in $US. PLEASE NOTE: We DO NOT accept PayPal. An Art Deco Czech Peking glass bead necklace with filigree-style silver plated links circa 1920s. 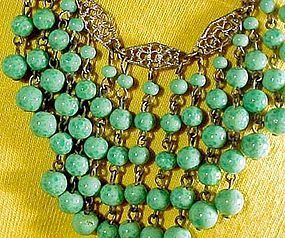 This elegant period 18" long Czechoslovakian dangly necklace has a 2-1/4" (maximum) fringed or strands of green glass balls; it has a spring-ring catch and it is in excellent vintage condition with no chips, cracks, bends, corrosion, losses, damage or repairs other than some minor plating loss to the spring-ring clasp. All items are thoroughly and conservatively graded and all condition issues are noted; all items are vintage or antique and may have slight signs of gentle use. Tracked packet insured air shipping to the U.S. starts at $16.50 (other spots may vary). Items paid with a credit card will be shipped to confirmed addresses only. We do ship internationally. All of our prices are in $US. PLEASE NOTE: We DO NOT accept PayPal. 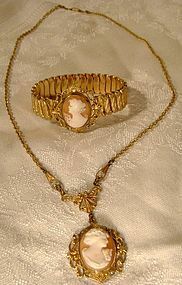 A nice quality and vintage c1910-20 gold filled expansion bracelet and matching necklace, all with hand carved shell cameo portraits. the bracelet measures 1-1/4" across, the bracelet measures 5-7/8" around at rest, the 17-1/2" necklace has a snapover clasp and the central pendant hangs down by 2". This set is unsigned and is in excellent condition with no chips, cracks, dents, bends, corrosion, losses, damage or repairs. All items are thoroughly and conservatively graded and all condition issues are noted; all items are vintage or antique and may have slight signs of gentle use. Expedited tracked and insured parcel shipping to the U.S. starts at $22 (other spots may vary, air is higher). Items paid with a credit card will be shipped to confirmed addresses only. We do ship internationally. All of our prices are in $US. PLEASE NOTE: We DO NOT accept PayPal. 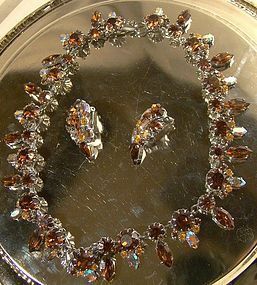 A vintage and wonderful Austrian cinnamon, amber and aurora borealis rhinestone 16-3/4" long and 1" wide necklace with a hook and eye clasp and matching 1-1/2" x 7/8" clip-on earrings c1950s. This set's stones are all claw-set, it is chrome or rhodium plated, and all pieces are signed MADE IN AUSTRIA. Our pictures don't do this set justice. This set is in excellent condition with no chips, cracks, dents, bends, corrosion, losses, damage or repairs. All items are thoroughly and conservatively graded and all condition issues are noted; all items are vintage or antique and may have slight signs of gentle use. Tracked insured air shipping to the U.S. starts at $18.50 - this includes online tracking, air service and insurance up to $100. Items paid with a credit card will be shipped to confirmed addresses only. We do ship internationally. All of our prices are in $US. PLEASE NOTE: We DO NOT accept PayPal. An Art Deco chrome yellow crystal bracelet from the 1920s. 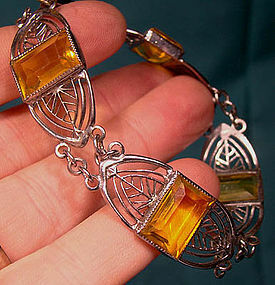 This true vintage Art Deco bracelet has intense yellow crystal stones. This 7-1/8" x 5/8" chrome plated bracelet has fine wirework on its four linked segments; each bezel-set crystal is in the intense Chrome Yellow colour popular at the time. It is unsigned, it has a box clasp, and it is in excellent condition with no chips, cracks, dents, bends, corrosion, losses, damage or repairs. All items are thoroughly and conservatively graded and all condition issues are noted; all items are vintage or antique and may have slight signs of gentle use. Tracked Packet shipping to anywhere in the U.S. is $14.00 - this includes online tracking, air service and insurance up to $70. Items paid with a credit card will be shipped to confirmed addresses only. We do ship internationally. All of our prices are in $US. PLEASE NOTE: We DO NOT accept PayPal. A vintage sparkling 17-1/2" gold filled rhinestone and goldstone necklace by Star-Art. 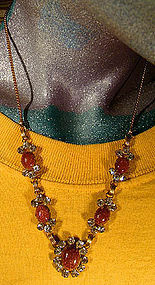 The stones are claw-set; the goldstones have a rich cinnamon colour with lots of flecks giving a great flashy effect. This necklace has an unusually ornate spring-ring catch and it measures 1" x 7/8" across the large central drop. It is signed STAR-ART 1/20 12K G.F. on the back, and it is in excellent original condition with no chips, cracks, dents, bends, corrosion, losses, damage or repairs. All items are thoroughly and conservatively graded and all condition issues are noted; all items are vintage or antique and may have slight signs of gentle use. Small packet air shipping to the U.S. starts at $9.50 (other spots may vary). Items paid with a credit card will be shipped to confirmed addresses only. We do ship internationally. All of our prices are in $US. PLEASE NOTE: We DO NOT accept PayPal, only VISA and MASTERCARD. 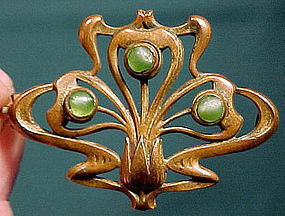 A vintage, flowing lines Art Nouveau gilt brass 1-1/4 x 1-1/8" brooch c1890-1900. It has a c-clasp, cabochon green glass faux moonstones, and it is unsigned; it is in very good original condition with no cracks, dents, bends, corrosion, damage or repairs other than the loss of most of the gilding (traces remain) and a flake to one stone and some minor dulling from wear to the others (the chip is accented by our lighting and it is barely visible when the pin is worn). All items are thoroughly and conservatively graded and all condition issues are noted; all items are vintage or antique and may have slight signs of gentle use. Small packet air shipping to the U.S. starts at $9.50 (other spots may vary). Items paid with a credit card will be shipped to confirmed addresses only. We do ship internationally. All of our prices are in $US. PLEASE NOTE: We DO NOT accept PayPal, only VISA and MASTERCARD. A vintage Art Deco period 14-1/4" cherry red celluloid & brass choker necklace c1930s0. 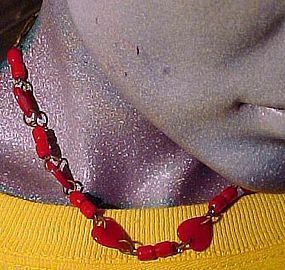 It is made of cherry celluloid hearts and barrel beads with brass mountings. This cheery choker necklace measures 1/2" across the hearts, it has a gilt brass clasp, and it is in excellent original condition with no chips, cracks, dents, bends, corrosion, damage or repairs other than some minor gold plating loss to the clasp. All items are thoroughly and conservatively graded and all condition issues are noted; all items are vintage or antique and may have slight signs of gentle use. Small packet air shipping to the U.S. starts at $9.50 (other spots may vary). Items paid with a credit card will be shipped to confirmed addresses only. We do ship internationally. All of our prices are in $US. PLEASE NOTE: We DO NOT accept PayPal, only VISA and MASTERCARD. 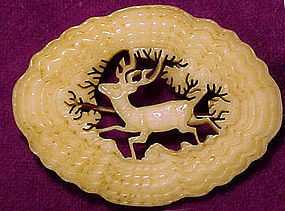 A vintage Victorian 1-3/4" x 1-1/4" hand-carved bone pin c1860-80, depicting a stag or reindeer in the forest. Finely carved with nice detail in the border and tree limbs, this pin has a brass c-clasp and it is in excellent original condition with no chips, cracks, corrosion, losses, damage or repairs other than the replacement of the simple wire pin. All items are thoroughly and conservatively graded and all condition issues are noted; all items are vintage or antique and may have slight signs of gentle use. Small packet air shipping to the U.S. starts at $9.50 (other spots may vary). Items paid with a credit card will be shipped to confirmed addresses only. We do ship internationally. All of our prices are in $US. PLEASE NOTE: We DO NOT accept PayPal, only VISA and MASTERCARD. 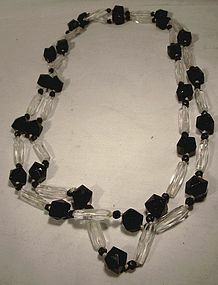 A genuine Art Deco 1920s long strand of faceted white crystsal and black French jet 1/2" wide beads strung on cord. This unsigned true flapper necklace measures 52" long and it is in excellent condition with no cracks, losses, damage or repairs other than some minor edge chipping and abrasions to some of the crudely fashioned beads. All items are thoroughly and conservatively graded and all condition issues are noted; all items are vintage or antique and may have slight signs of gentle use. Small packet air shipping to the U.S. starts at $9.50 (other spots may vary). Items paid with a credit card will be shipped to confirmed addresses only. We do ship internationally. All of our prices are in $US. PLEASE NOTE: We DO NOT accept PayPal, only VISA and MASTERCARD. 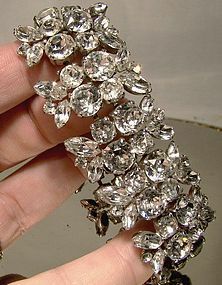 A flashy, high quality signed Sherman white rhinestone bracelet c1950s. This 7-3/4" bracelet measures 1" wide and it has a box clasp. The claw-set stones are marquise and round and this bracelet is in very good condition with no chips, cracks, dents, bends, corrosion, losses, damage or repairs other than the replacement of one large, one medium and 4 small edge round stones with lesser quality non-Sherman stones and the loss of the (now missing) safety chain. All items are thoroughly and conservatively graded and all condition issues are noted; all items are vintage or antique and may have slight signs of gentle use. Small packet air shipping to the U.S. starts at $9.50 (other spots may vary). Items paid with a credit card will be shipped to confirmed addresses only. We do ship internationally. All of our prices are in $US. PLEASE NOTE: We DO NOT accept PayPal, only VISA and MASTERCARD. 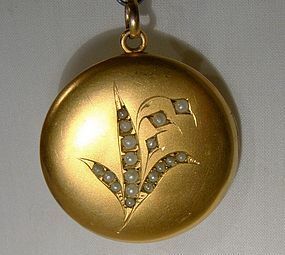 An attractive vintage hand engraved 1-3/8 x 1" gold filled photo locket mounted on a contemporary bow style pin. 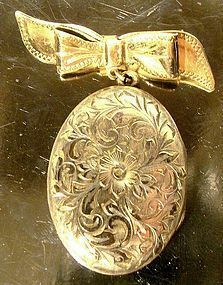 The locket is decorated on the front and it has an engraved border on the rear; it has two retaining bezels and a couple of instant relatives on the inside. The 1-5/8" wide bow pin has a safety clasp and it is stamped GOLD FILLED J.S-C. This vintage c1920s-30s pin is in excellent condition with no dents, bends, corrosion, losses, damage or repairs other than a few short scrapes on the back. All items are thoroughly and conservatively graded and all condition issues are noted; all items are vintage or antique and may have slight signs of gentle use. Small packet air shipping to the U.S. starts at $9.50 (other spots may vary). Items paid with a credit card will be shipped to confirmed addresses only. We do ship internationally. All of our prices are in $US. PLEASE NOTE: We DO NOT accept PayPal, only VISA and MASTERCARD. 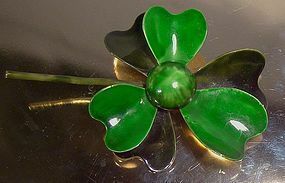 A signed ORIGINAL BY ROBERT 3-7/8 x 2-1/2" large green enamel flower pin c1950s-60s. This gold plated pin has a safety clasp, and it is in excellent condition with no dents, bends, corrosion, losses, damage or repairs other than a bit of edge chipping to the enamel and a spot of loss on one leaf. All items are thoroughly and conservatively graded and all condition issues are noted; all items are vintage or antique and may have slight signs of gentle use. Small packet air shipping to the U.S. starts at $9.50 (other spots may vary). Items paid with a credit card will be shipped to confirmed addresses only. We do ship internationally. All of our prices are in $US. PLEASE NOTE: We DO NOT accept PayPal, only VISA and MASTERCARD. 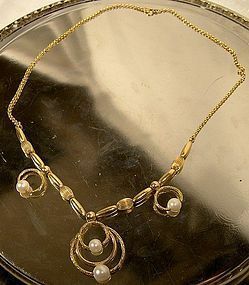 A nice quality and attractive 17-3/8" gold filled necklace with a central 1-1/8" drop and complete with cultured pearls. The pearls measure from 6-7 mm. and this unsigned necklace has a springring clasp. The spring ring is stamped 1/20 18K GF, and this necklace is in excellent condition with no chips, cracks, dents, bends, corrosion, losses, damage or repairs. All items are thoroughly and conservatively graded and all condition issues are noted; all items are vintage or antique and may have slight signs of gentle use. Small packet air shipping to the U.S. starts at $9.50 (other spots may vary). Items paid with a credit card will be shipped to confirmed addresses only. We do ship internationally. All of our prices are in $US. PLEASE NOTE: We DO NOT accept PayPal, only VISA and MASTERCARD.